The 2015 PokerNews Cup Main Event turned into a German affair on Monday, when Christian Krupp and Torsten Wichtrup engaged in one the quickest heads up in the Cup’s history. Shortly after the Czech Republic’s Slavomír Byrtus left the table in third place for a €24,560 payday, things escalated quickly until one of the two Germans still in play managed to secure the Main Event title. Ironically, it took only a few hands after Wichtrup declined a chip-chop deal to get down to the decisive hand. 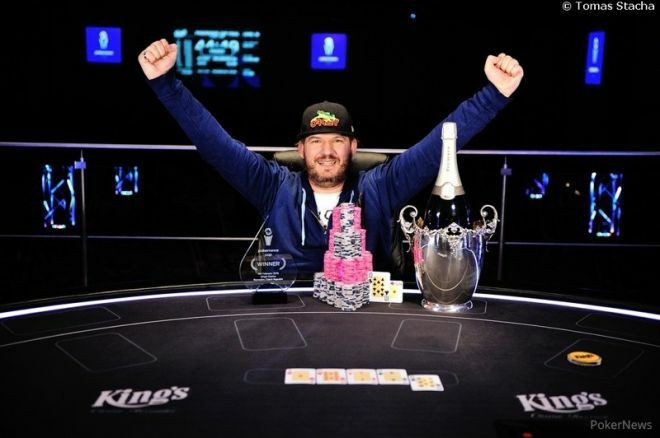 All in with , Wichtrup was unable to beat Krupp’s as the board showed to give Krupp the €57,473 top prize and the trophy. Although Wichtrup, who started the final day with the biggest stack, may have some regrets, the €34,993 prize he brings home seems incredible considering how things went for him during Day 2. Before an impressive comeback gave Wichtrup the lead in the last level of Day 2 with more that 5 million in chips, his tournament life was often at risk - especially after dwindling down to 300,000. Yet, even Wichtrup's remarkable ability not to tilt in the most difficult moments of the competition could not match Krupp’s determination to bring the title home and leave the King’s Casino in Rozvadov as the 2015 PokerNews Cup Champion. The eighth edition of the PokerNews Cup was an impressive success both in terms of participation and quality of the action at the tables. Originally launched as a €200,000 guaranteed event, the series’ €250 buy-in Main Event shattered the guarantee thanks to the 1,550 players who showed up to the King’s Casino to play and enjoy a weekend of poker at the tables of the PokerNews Cup and at the cash games. "It's great to come back to the King's Casino in Rozvadov for an event like the PokerNews Cup," German model and poker player Johanna Hupfer told PokerNews during Day 2. "The gigantic number of entries proves that PokerNews and King's Casino offered a great tournament this weekend." Among those impressed by the unexpected turnout was Tarkan Karadas, one of the organizers of the event. Talking to PokerNews, Karadas explained that he was particularly happy to see that King’s regulars and many more European players answered PokerNews' call and flocked to the casino to take part to the Main Event and all the side events on the schedule. Recreational players aside, the 2015 PokerNews Cup also attracted a good number of poker pros including World Series of Poker (WSOP) bracelet winner Jörg Peisert, Eureka Poker Tour regular Eusebiu-Niclae Jalba, and the Czech Republic's Michal Maryška, who currently sits 10th on his country's all-time money list (source: HendonMob). As expected for an event at the King’s Casino, PokerNews’ own live tournament series has welcomed also a number of local VIPs. Besides Hupfer, the Cup attracted personalities like Who Wants To Be a Millionaire? winner Sebastian Lang and popular TV presenter and actor Petr Rychly.